Once again, summer is quickly turning into a sweet memory, while the new school year has crept up on us like ill-fitting underwear. Sigh. The good news is that there are so many things I love about fall! For example, the change in season and lifestyle give me a wonderful opportunity to get recharged, refocused and reorganized! The first fall order of business at our house? 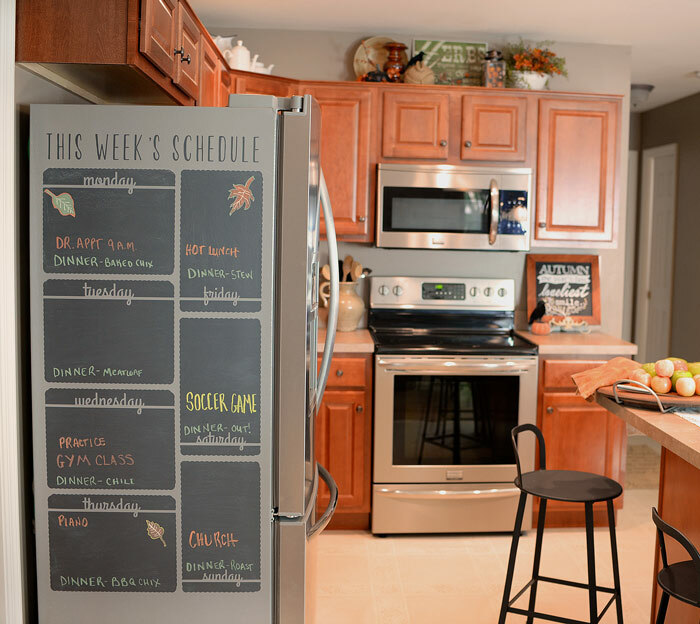 Create a stylish family schedule – displayed in a prominent location – to help us keep track of all our tasks, events and appointments. 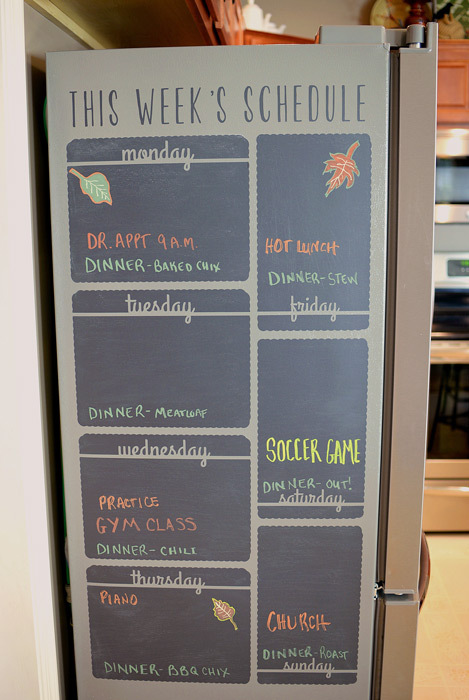 I chose to place the vertical weekly schedule on the side of our refrigerator because this is a high-traffic area of our home. It is an area visible both from our kitchen and living room, and everyone passes by it multiple times daily. I believe this is one of the keys to maintaining a hanging schedule; it should be placed in a location where people pass by frequently. After deciding on the location, I began applying the vinyl decal to the fridge. For the full details on exactly how I did this project, check out my full post in the Royal Design Studio Paint+Pattern magazine. This schedule is helping our family stay organized and on top of our daily events. I also love that I can customize it for any season. The kids enjoy using it, too. How do you keep track of your busy fall schedule? 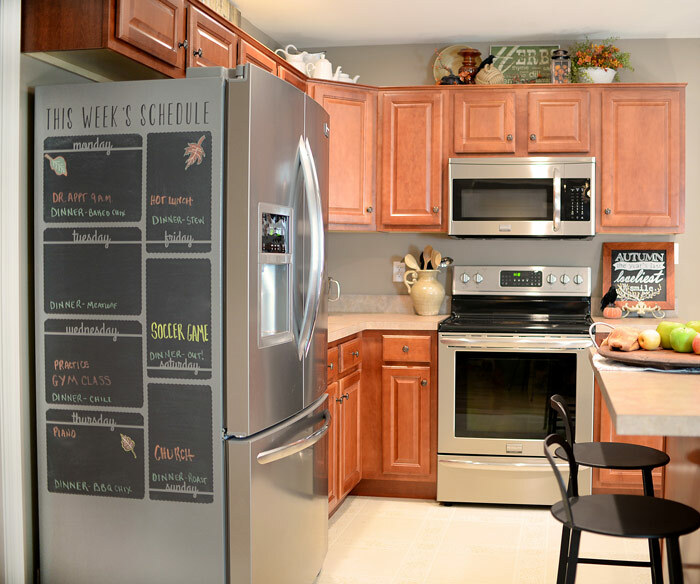 This entry was posted in Decorating, Kitchen, Organization and tagged Chalkboard schedule, Royal Design Studio by Susan. Bookmark the permalink. In love with this! Pinning for later because I may need to try this one! I bought chalkboard contact paper and applied it to the side of my refrigerator. A less expensive alternative, and it works great. Sylvia, Where do you buy chalkboard contact paper? What size did you use on the fridge ? Large or small?